From time to time things can go wrong and mistakes can happen, which is very upsetting to us and we take it personally if our product does not meet or exceed our customers’ expectations. What is covered under our policy? Our policy covers the aspects of our business that we have direct control over and does not cover the actions of third parties. To deliver high-quality products in a timely manner. Due to different material types, we cannot guarantee color matching between materials as they take ink differently, print on different printers and have different production processes. and even if using the same color values, there can be slight variations. We only print CMYK colors. On Fabric’s we do not guarantee how PMS, Pantone, RGB, Spot or 5th colors will print out. They can print incorrectly, inverted or drop completely from the file. Please convert your colors to CMYK only to prevent major color issues.Please be aware colors on screen will appear darker when printed and to create file accordingly. When printing photographs, please make sure the color values and color space are both CMYK only. In the unfortunate event that a Rush or Express order has been delivered after the estimated delivery date, we will refund you the shipping charges. Please allow up to 8 business days for the payment to be reversed on your card. We will not reimburse for lost or stolen packages that have Proof of Delivery. If your order has arrived damaged we will replace it with a reprint of the damaged products. We require a photo to clarify the condition of your order before processing the reprint. The Banner Store will reprint original art uploaded on original order. If the quality of the products you received is not satisfactory, please contact us within 10 days. We require a photo to clarify the issues with your order and may also ask that you ship back the products to us. The Banner Store does not reimburse for return shipping costs if it is determined that there is nothing wrong with the product being returned. The Banner Store will not be responsible for color matches if PMS values are not specifically requested on the purchase order. 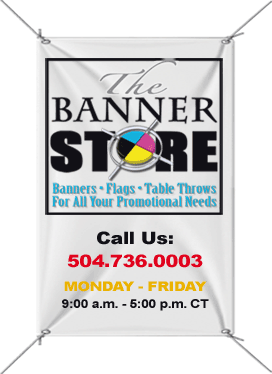 If you are not satisfied with your order, please contact us by emailing customerservice@thebannerstore.net within 10 days of receiving your order. We work hard to respond to your requests within 1 business day and we will do everything we can to assist you.